My Favorite Holiday Photo Gift + THREE $100 Giveaways! You know me… I’m not a big fan of printing photos. Instead, I prefer using digital photos to make digital photo albums for our family and for each of our kids on a yearly basis. I do use the “free 101 prints” deals that pop up every now and then to order a handful of our favorite pictures each year. I give some to the grandparents and great-grandparents, some to Nora to “decorate” her room, and I use some to update my favorite black frames. Other than that, we never print any pictures. However, when it comes to buying Christmas gifts for grandparents and great-grandparents who really don’t need anything… we’ve found that photo gifts (and gift cards) are often the way to go! For the last couple of years, we’ve ordered photo calendars for both sets of grandparents as part of their Christmas gift from the kids. Nora was THRILLED to give them the calendars, and based on their reactions, I think the grandparents were happy to receive them as well. It has become a tradition of sorts by now — so I’m sure I’m not spoiling any surprises by sharing that we have ordered calendars again this year! In fact, this year, we actually ordered one for ourselves too! I don’t want to ruin all the surprises, so I won’t be sharing any pictures from our 2016 calendars (at least not yet! 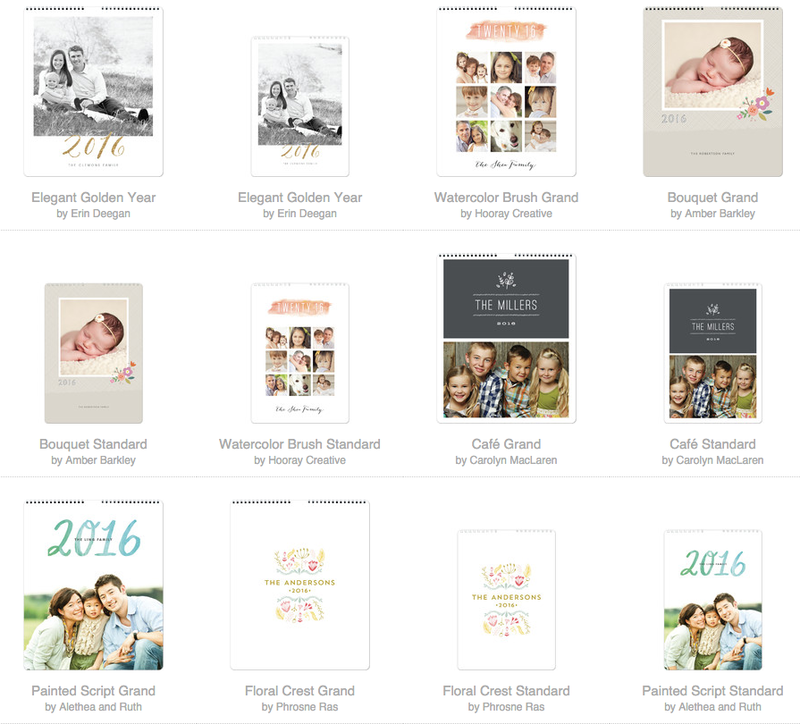 )… however, I will say that I’ve been extremely pleased with the calendars we’ve ordered from Minted.com. 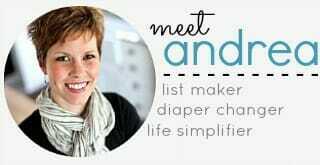 Not only do they have a fabulous selection, they also make it relatively simple to customize the calendars to your own style — if that’s something you like to do. Minted.com also offers a massive variety of extremely cute photo gifts, photo art, photo decor, and of course, photo cards and announcements! 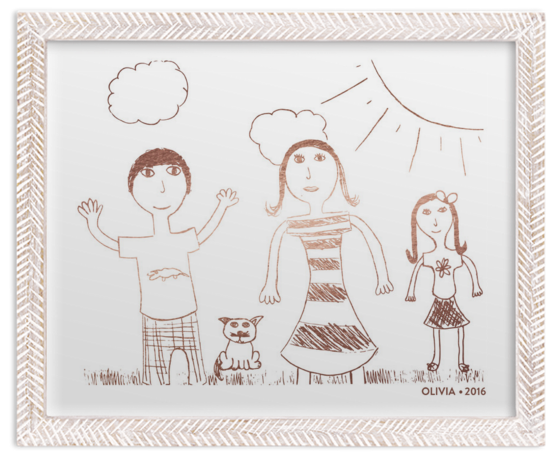 There is even a REALLY fun option to upload your child’s artwork and have it printed out and framed! I can’t wait to do some of the framed artwork for Nora once she’s older! Another item I’ve had my eye on for the past few years is their custom silhouette artwork. I think it would be so fabulous to do this for all our kids some day. 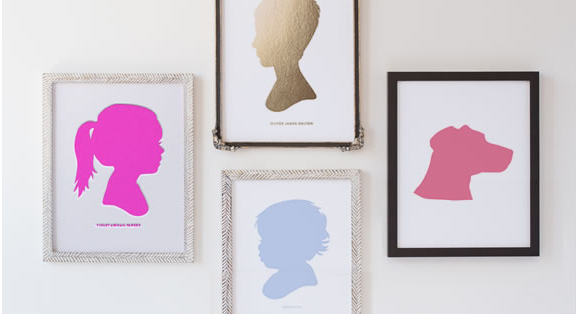 Minted.com literally had something for everyone on your gift list this year — and you’d be hard-pressed not to find the perfect holiday card for your family amidst their vast selection! 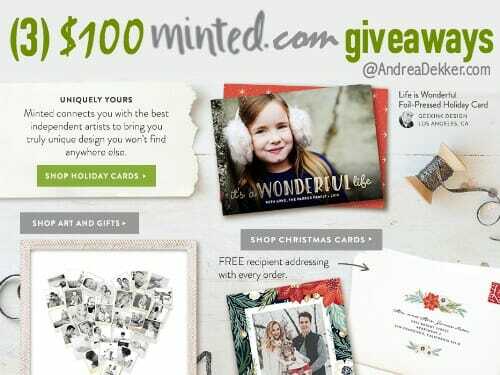 If you are in the market for fabulous photo gifts or top-notch holiday cards, you’ll be happy to know that I’ve partnered with Minted.com to offer THREE lucky readers a $100 gift certificate — good for anything on Minted.com! Also, everyone can get $25 off their first $100 Minted.com purchase via this link. To enter, simply type your name and email address into the corresponding blanks via this link. What are your favorite photo gifts? 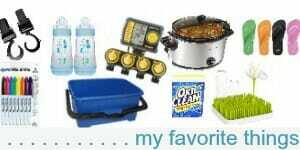 This giveaways end at 11:59 pm EST, Wednesday, 11/25/2015 and is open to US residents, 18 years or older. The winners will be randomly selected and notified via email. I received a duplicate prize package in exchange for hosting this giveaway — but all opinions are 100% my own. Please see my full disclosure policy and contact me with any questions you have. Good luck! Life Lessons From Our "Lemonade Stand"
Brilliant! I’ve done scrap booking calendars for grandparents, but that got labor-intensive. I would love an easier way to do calendars! I love seeing people’s photo jewelry, but have never tried to get any. yes, this is so easy — because you can use a template if you want! I love to make photo gifts too. I’ve started calendars before, but always decide against it, since I feel like it’s a more disposable item (although I’m sure you could keep it as an odd keepsake). I usually make a photo yearbook (at least for the last couple of years after you inspired me to finally start) that I give as a gift to my husband. The yearbooks are large and have many pages, so I only print one. But I’ll also make little highlight books of the kids with grandparents and other extended family then I print out multiple copies and give them as gifts. I use Shutterfly a lot because I’m always getting coupons and $20 credits. I’ve ordered our Christmas cards through them many times getting a couple free 8×8 photo books to give out and 100 or more lovely cardstock cards for $50 or less by stacking coupons, sales, free shipping etc. I keep meaning to try other websites for these services, but I’ve gotten used to Shutterfly and the coupons keep coming in. I’ve had a hard time finding better prices anywhere else. I’ve always loved tinyprints.com card designs more than Shutterfly’s, I’m not willing to pay their prices though. LOL I’ve also given some of Shutterfly’s photo mugs and sliver photo keychains and the quality has been excellent. Nobody ever complains about photo gifts. 🙂 I’ve been please with the speed, quality and customer service I’ve received there. 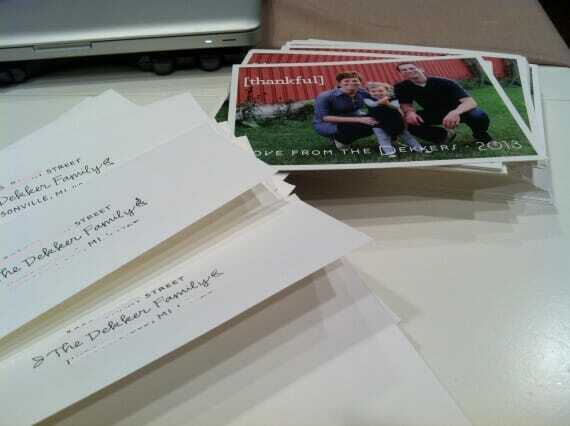 I used Minted for my holiday cards this year! I also have been looking through their art for baby #3’s room. Great idea to make a calendar. My 3 year old is obsessed with calendars, so I actually think this would be a great gift for him! yes, we’re actually giving our calendar to Nora because she is obsessed with counting the days in the months and learning about months of the year. Hopefully this will serve as a “teaching tool” for her next year! We too have been doing calendars for the grandparents and great grandparents for several years. In my family, my kids are my parents only grandchildren, so that’s easy. For my ILs, my SIL and I work on it together and split the cost. For the past several years, for my MIL’s parents, I’ve taken photos from all of the cousins and their families. 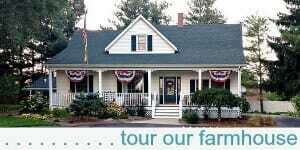 We have enough little families that we each get a month to display a few favorites from throughout the year. It is by far my favorite gift to give. I have fun putting it together. I also do one for us, and I work on it throughout the year each month when I do our “yearbook”, so the one for us is ready to print after we take some pics in front of our tree. I like to use pics from the month on the calendar (so Nov this year are pics are of my youngest who was born the week before Thanksgiving last year, a huge family reunion, and Thanksgiving). For my parents and my ILs, I just swap out a pic here and there to include proper additional family members, so it doesn’t take me too long. My husband and I were just discussing gift ideas for the grandparents last night. Perfect timing as I have never done a photo calendar. That would be perfect!! I had a mug made for my dad back when my oldest was one. 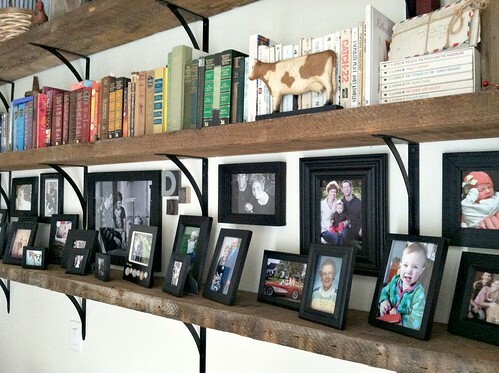 There are so many awesome options for photo gifts now. Thanks for the ideas! !